To uninstall Office 2016 for Mac, move the applications and user preference files to the Trash. Once you've removed everything, empty the Trash and restart your Mac to complete the process. You can also perform a complete uninstall for Office 2016 for Mac  if you are troubleshooting an issue. You must be signed in as an administrator on the mac or provide an administrator name and password to complete these steps. Command +click to select all of the Office 2016 for Mac applications. Ctrl+click an application you selected and click Move to Trash. On the Finder menu at the top, click View > as List, and then click View > Show View Options. 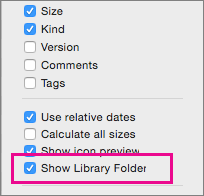 In the View Options dialog box, select Show Library Folder and save. Back in Finder, open Library > Containers and ctrl+click each of these folders and Move to Trash. Not all of these folders may be present. Warning: Outlook data will be removed when you move the three folders listed in this step to Trash. You should back up these folders before you delete them. Click the back arrow to go back to the Library folder and open Group Containers. Ctrl+click each of these folders if present, and Move to Trash. 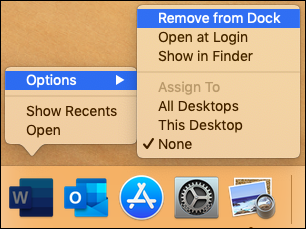 If you put any of the Office applications in your dock, go to each one and ctrl + click > Options > Remove from Dock. Restart your Mac to complete the uninstall.